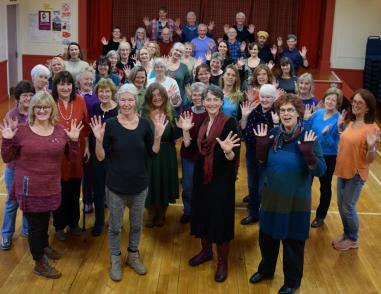 Eastgate Theatre, Peebles, 7.30 p.m.
Traquair Choir is a friendly community choir based in the Scottish Borders. Our singers travel from all over Tweeddale to make music together, sing to a high standard and have fun. Our rehearsals are full of friendship and laughter as well as quality singing. Traquair Choir was founded in 2014 after a Hogmanay ceilidh brought Elaine Heron and Julie Harvey together, and the choir was born! We now have over 50 members. We sing a range of styles of music in unison and harmony; classical, world music, folk, jazz and pop. We welcome singers of all ages and musical backgrounds and for some people it has been their first experience of singing. We perform in many local venues and enjoy collaborating with other choirs and musicians. The Importance of the River Tweed The Tweed at Kelso – the Junction beat, which is the most productive on the river.